The new international airport planned for Istanbul ... architectural masterpiece. Kolin Insaat, a member of the Turkish Contractors Association, is making waves both in its domestic market as well as internationally with its involvement in big-ticket projects. In its home market, the company is both a member of the investor group and among prime contractors working on the third Istanbul airport. 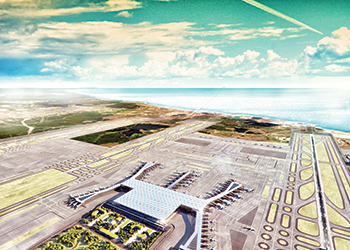 Under a $11.37-billion deal inked late last year, Kolin Insaat is working on a build-operate-transfer model for the airport which has been designed to be the world’s largest airport. The company is also engaged in the rehabilitation of the approximately 103-km-long single track railway line between Konya and Karaman. In the GCC, it is part of the consortium that has been named the preferred bidder for the construction of Lines B and C of Makkah Metro in Saudi Arabia. The consortium includes Isolux Corsan of Spain, the leader and Saudi Haif. The contract comprises Phase One of the Makkah Metro project and is estimated to cost €2.3 billion ($2.54 billion). The lines are due to be up and running by 2019. Line B will comprise 11.9 km of tunnels and three stations, while Line C adds will be 13 km long and have six stations – two of which will be major interchanges, says a Kolin spokesman. The client has started negotiations with the consortium with a contract expected to be signed in the coming months (see Saudi Focus). The Kolin Group of Companies was founded in 1977 with the establishment of Kolin Insaat. The group, which has exhibited a sustainable growth model with its stable performance since its establishment, has established a niche among reputable and powerful companies in Turkey. Its scope of activities is in constructioncontracting, energy, port operation, and mining and tourism sectors. Operating primarily in the contracting sector, Kolin Insaat is the main company and the driving force of the group. The company has successfully completed numerous projects acquiring 37 years of experience, financial strength and technical competence. The company’s business portfolio includes infrastructure and transportation projects as well as agriculture and energy, buildings, housing and industrial plants projects.